Iririki Island Resort & Spa is a stunning property situated exclusively on a 69-acre private island in the heart of Port Vila Harbour. It is only a 3 minute ferry ride from the township of Port Vila to the island with a 24 hour service, complimentary to guests. The resort offers tropical resort gardens, a private beach and great snorkelling along with facilities such as kids club, day spa, restaurants & bars. This is an advance purchase rate that must be booked more than 60 days prior to arrival. Full payment is required at time of confirmation. This rate is fully non-refundable. Iririki Island Resort & Spa is a stunning property situated exclusively on a 69-acre private island, in the heart of Port Vila Harbour. It is only a 3 minute ride from the township of Port Vila to the island with a 24 hour ferry, complimentary to guests. The resort offers tropical resort gardens, a private beach and great snorkelling. This Vanuatu accommodation offers a fantastic range of room types and resort facilities to suite couples and families. Iririki Island Resort & Spa is located just minutes from Port Vila township on a private island, ideal for that Vanuatu tropical island getaway. 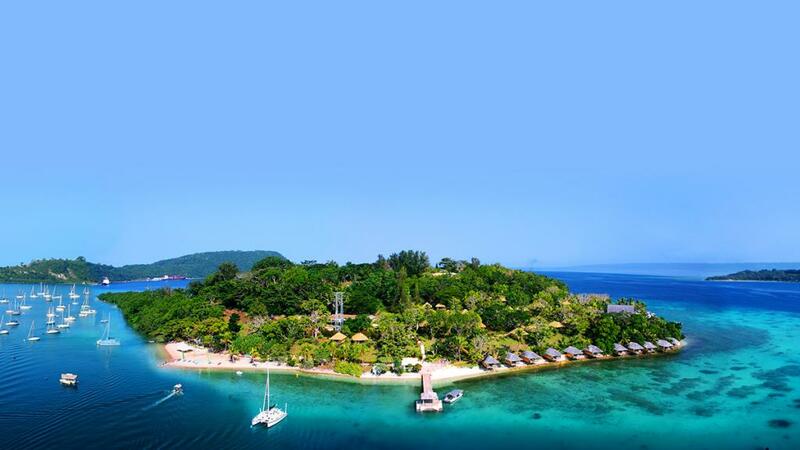 Amazing Vanuatu Offer: Save 30% + Bonus Offers! Iririki Island Resort & Spa is a haven of privacy and under-stated elegance occupying its own island. Here you can watch million-dollar sunsets, create skies like an artists palette, sip equally kaleidoscopic cocktails pool-side at the Bali Hai Bar and dine as you've never done before in Azure Restaurant, with its breathtaking views overlooking the harbour and township. This is a fully non-refundable rate. Full payment required at time of confirmation.